St. John's Lutheran Church > Blog Timeline > Connect+Care > Mean Mug: New Location and Partnership with S.O.A.R. 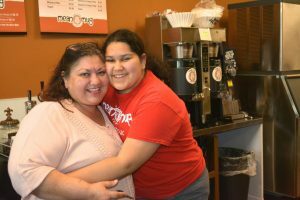 Evelyn Medina gets a hug from her daughter, Sascha, who has grown up in the business. On March 8, Evelyn Medina opened her new digs at 110 N. Main St. on the Square. Things have calmed down a bit from a huge opening week that drew guests from the N.C. Main Street Conference, but Evelyn says that evenings are still busy and daytime hours are steady. Mean Mug is open 6:30 am-9 pm Monday-Thursday; 7 am-11 pm Friday; 8 am-9 pm Saturday; and 10 am-8 pm Sunday. Not only is Evelyn in a new location, she has a new business model, too. Students in the S.O.A.R. program at Rowan-Cabarrus Community College are serving as interns at Mean Mug. After graduation, Evelyn will determine which of the graduates can move on to full-time employment there. S.O.A.R. stands for Skills, Opportunity, Awareness, Readiness, and it’s a community college program specifically designed for adults with intellectual disabilities. When Evelyn was thinking about moving her business downtown from South Fulton Street, architect Pete Bogle, who owns the building where Mean Mug is now, asked if she’d be interested in employing members of the S.O.A.R. program. Evelyn had to chuckle when Pete wanted to tell her all about S.O.A.R. “I’m quite familiar with the S.O.A.R. program,” she told Pete. That’s because Evelyn’s brother, Harold, also a member of St. John’s, is a part of that program, too. About 10 students are doing internships at Mean Mug, rotating through on different days and times of day. Meanwhile, Evelyn has hired three new employees and brought two with her from her original location. 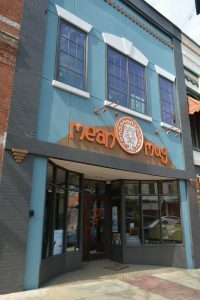 Mean Mug Coffee Co. opened at its new location, 110 N. Main St. on March 8. She absolutely loves the new location, she says, and she loves the new sign Pete put up for her. The new location has about the same depth of the original location, but is narrower. On the other hand, Evelyn says, she has a basement with plenty of storage.